the top podiums were so crowded the Wijk organizers may have worried they'd have to request an extra batch of trophies. Today Anand and Nakamura both won convincing games, and once again took off into the lead. Carlsen lost in a complicated game to Nepomniachtchi. In "B", Efimenko beat McShane and joined So on top after Sargissian also lost. After nine rounds, it was pretty much impossible to point to a favorite, whether in the “A” group or the “B” group. The organizers had to wonder whether they even had enough trophies at hand. Still, the tenth round was everything the fans wanted with glorious victories and disgraceful defeats to keep everyone on their toes. 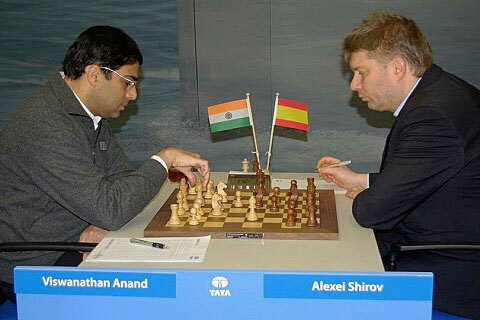 In the top event, the very same two names who have been the cast stars throughout, Nakamura and Anand, once more took the spotlight. Nakamura challenged Vachier-Lagrave to play the Gruenfeld variation made famous in the 2010 World Championship, but the French GM chose to take a side road that never worked out for him. Anand actually played the exact same opening novelty Aronian employed the day before, and it was clear the Indian had come prepared, while the Spaniard had not. The other big result of the day was Nepomniachtchi’s visceral win over Carlsen.